We have to give big props to teachers and other school staff and administrators – they have a really tough job, and they do it everyday with love! Whether they’re in the classroom with the students, helping them through the cafeteria or in the library, or driving them to and from school everyday, these heroes make our kids’ lives better every single day. Their jobs are hard, and yet they still find ways to go above and beyond! A Facebook post is making the viral rounds, showing just how much some teachers care, and how they never stop finding ways to make their students’ lives better. 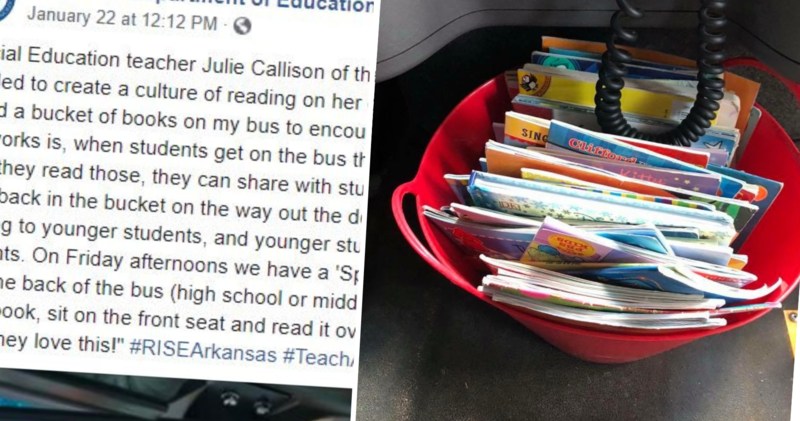 The post was shared by the Arkansas Department of Education, and highlights a special education teacher’s brilliant idea for bus rides. It’s a really simple thing, but it’s made such a difference for her students. Julie Callison teaches special education in the Drew Central School District in Arkansas. One day, she was cleaning out books in her classroom to take them on vacation, and brought them with her on the bus ride home after school. On that ride, one of the students had a bit too much energy, so Callison asked the girl’s older brother to read to her from one of Callison’s books. Other students noticed, and asked Callison why they couldn’t have a book to read as well. And the rest is history! Callison began keeping a bucket of books on the bus for students to read during the ride. When they get on the bus, they’re allowed to choose three books to take to their seats. When they’re done with a book, they can swap with other students and pass books back and forth. As they leave the bus, they drop the books back in the bucket. Not only does it keep the kids occupied during the bus ride (when kids tend to wild out a bit after a long day in the classroom), but it’s encouraging kids to use their free time to read, building their reading skills and getting better. On Fridays, they even have a “Special Guest Reader”, which is a middle or high school student who reads a book to the whole bus. We couldn’t love this idea more, and we’d love to see it implemented all over the country! Well done, Julie Callison! Your students are lucky to have you!